Dremel has been around for over 75 years and is the leader in rotary tools. With over 150 attachments, there almost isn’t a job that the Dremel can’t handle. This fall Dremel introduced their newest tool, the Dremel 4000, a new top-of-the-line corded rotary tool. This is their highest performing and most versatile rotary tool yet. Dremel sent me my very own Dremel 4000 with attachments and carrying case to review. The first thing I like about this tool is that it is already compatible with all of the current Dremel attachments so if you already have some attachments, you won’t have to replace them. Along with the Dremel 4000, I received a number of attachments including a circle cutter, sanding grinding guide and numerous smaller attachments such as engraving cutters, wire brushes, sanding accessories and Tungsten carbide cutters to name a few. It also came with some extra sanding pads. The instructions, manual and product sheet that came along with it is very easy to follow and everything is stored in a solid carrying case for easy storage. I found the Dremel 4000 to be lightweight and easy to handle. My husband reviewed the Dremel and gave me his two cents that I want to include here. He said when he first looked at everything it was a little overwhelming (the tool and all of the attachments) but the tool is user friendly and he was quickly able to learn which attachment did what. He also said it’s easy to grip and packs plenty of power into a small package – his words, not mine! You can even use this tool to sharpen your lawn mower blades. 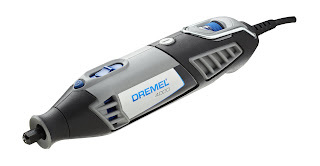 This is a great gift for any wood worker or handyman/woman and the Dremel 4000 sells for a suggested retail price from $79 to $99 everywhere Dremels are sold. Considering all of the different jobs you can tackle with the numerous attachments and more than 150 available accessories, it is definitely a tool worth owning. Can you think of any projects you might need this for? I would love to try the candle engravings; they look beautiful! I have been doing alot of DYIs over the last year. The Dremel 4000 would be easier to handle than a router and great for detailed work. I bead and make jewelry. I've heard that Dreme;s are wonderful for this hobby! My dad would love it for his woodworking projects. I would use the Dremel 4000 to refinish a chair back. Cut wire shelving to finish my wife's closet! I would love to use the Dremel to do some simple wood carving. Always wanted to pick that up. Thanks for the giveaway… We are repairing several damaged tiles in our bathrooms and a Dremel tool is an excellent way to remove the bad tiles without damaging the ones we need to save. I would use the Dremel for finishing the edges of the countertop that we are installing. I would use it for small wood projects. I'd love to make the engraved candle. Thanks! I'd carve pumpkins with a rotary tool. My husband would find a many uses for it since he is a diy person. I'd love to give it to my husband for a tool for crafts or something to fix. Hi, I love to do crafts and I always wanted to do etched glass. I never knew you could do it with a dremel tool. trishden948(at)yahoo(dot)com Thanks for a great giveaway! I would use it to make Christmas decorations. I would love to try making a Shell bracelet! I would use it to make jewelry and other craft projects. What wouldn't I do with a Dremel? I would use it for my woodworking and craft projects, I would love to try my hand at etched glass. I would use it to restore some family antiques that need some loving attention. Then I'd hand it over to my husband so he could get to some of his "honey-do's"! I would like to try making an etched Bottle and some signs. I would use the Dremel to carve soapstone and alabaster, which is my new sculpting passion. I currently do it all by hand with small files and I'm told a dremel would make life much easier. The way I do it now is hard on the hands and very time consuming. Thanks so much for the opportunity to recieve such a useful tool. Thank you Dremel and The Bird's Day for offering this great giveaway! We would use this to sharpen mower blades, mostly, but I bet I could come up with a ton of stuff. This is easy. I am working on custom wood signs for each of our five dogs. The Dremel is the perfect tool. I entered the XShot giveaway! Not very good at this type of stuff, but this would be a great gift for my husband, and he could complete the Repairing an Auto Ding project in no time! I could use a Dremel around the house for many jobs. Just the other day I could have used it to sand down a piece of trim. This would be great for my husband who does woodworking projects. Id use it to fix odds and ends around the house. I would love to make the Personalize a Wood Picture Frame. My honey will be working on some projects at home that he could use this dremmel for. Sor far he has tiled the entryway, retiled and painted the fireplace. Next… not sure, but this tool will help him. This would be a great gift for my dad. He always has a project going on and could really use this! My hobby is woodcarving. I am an active member of an online woodcarving site (they also have a magazine). I would LOVE this tool. My tools are all hand tools, this would help me with details that hand tools can't capture. I'm currently carving a walking stick with many faces on it and several mini Santa's to give away at Christmas time. I have a project in need of a dremel – it has been on hold for a long time! I would give this to my husband for Christmas. I'm sure he could find a thousand uses for it. He does a lot of craft work. I'd like to do an art work of Wood and use this dremel to round out and smooth my edges on the sculpure. My husband builds models, refinishes furniture and lamps, creates sci-fi props (original and reproduction), and I'm sure he'd find many uses for a Dremel. The sad thing is, I gave him a Dremel when we were first married, brand name product, and it broke very quickly. Some little plastic piece inside. His friend had a Dremel that had lasted for years, so maybe it was a fluke we got a bad one. I'd sure love for hubby to be able to give it another try. I'd use the Dremel as a Christmas Gift for my father. Not sure what he'd do with it but I'm sure he'd love it. I've started to get into wood crafting, and this would be great for so many wood projects! I would like to make a sign for our ranch with our name on it. We are working on redoing our bathrooms, so this will be handy is so many ways. My husband would use it on the cabinets he's going to make! I would use this for making birdhouses with my daughter. I have always wanted one of these..I would probably etch glass first. I would also love to do some wood projects. I never knew you could use a dremel to carve a pumpkin. This is great! I want my husband to make a custom vanity table and he would have no excuse not to! I'd give this to hubby for christmas! He does a lot of woodworking and fiddly little things, I'm sure a dremel would help him a lot! I'll use this to cut drywall for an electrical box. I would use the Dremel 4000 to fix our kitchen chairs and bedroom door! I've never owned a Dremel, but i have to say am pretty shocked at all that can be done with it! Thank-you for the chance!! since we just bought a new house and plan on doing as much as we can ourselves, we would use this in most of our renovating projects! What wouldn't I use the Dremel for, I do a lot of wordwork and it would be great for the detail work. I would love to win this for my husband, he is quite the handyman. He'd probably like to make a Street Address Sign, thanks! I try and do a lot of home decorating. I buy plain shelves or bookcases and then decorate and paint them the way I like. This would be a great tool so that I can shape the things the way I would like them. I have a little wooden nightstand I would love to carve. I would use it to sand down the edges of some chairs before I paint them! Thanks! I would use it to finish several wood pieces that I need to paint but have put off because I hate to sand by sand. I would also use it to help me when I refinish the cabinents in my daughters new home.It would help with all the detail work on the cabinents. The first of many many things that I would do with a new Dremel would be to sharpen my lawnmower blades. Thanks for the great giveaway! I would love to try my hand at glass etching. I would use it to route a new fingerhole in a sliding closet door. I would give it to my father for Christmas! I would give this tool to my husband. His excuse for every project I ask him to tackle is: "I could do that if I had the right tool". Hear it is BABY. Carry on!!! My hubby would use this for his job. I'd love to create a Cut Egg Decoration. Christina – xristya@rock.com – I would give it to my brother, who does an endless variety of projects for his home – his latest is bay windows! One of the first things I'd use it for would be to re-slotting the stripped screw on my license plate! I always need a tool like this for fine polishing or cutting! There are so many things you can do with a Dremel! i have so many projects around the house i could use this for. it would also be great for crafts, too. we could definitely use this to fix some tiles in our bathroom. My dad is retired and woodworking has become his favorite hobby. I would give this wonderful prize to him for Christmas, and hope he'd use it to make me a birdhouse! Thanks. I have alot of small wood projects I would like to do. I want to make a giant bubble wand (out of wood), a birdhouse with the boys, and a little wooden box in the shape of a tooth, that you put your tooth in for the toothfairy. I need this exact tool to make that one. Well I first thought of using the Dremel 400 to shave some of my doors. I live in a brand new house and in the summer the doors swell up and I can't get a couple of them shut. I saw a comment for using it to shave dogs nails. I would definitely try that also. It would probably work just like a Pedi-Paw. I make wooden Santas and this sure would make making them a whole lot easier and more detailed. Be a great gift fo my daughter and son thy both race cars and could use it to make repairs. I would love this! I would use it for pumpkin carving, candle engraving and some household projects. This would be a big help on the kitchen cabinets that we are refinishing. We were recently given a dining room set that is approximately 50 years old. I love this set and have been wanting to refinish it and this would be perfect for getting into the Hard to reach spots. I have several antique pieces of furniture that need some TLC. I would give it to my dad as a gift. He is always helping me around my new house with projects and such I'm sure he could put it to good use. I would use it to create beautiful designs in pumpkins for halloween. I sure could use this for my projects. I would give this as a gift to my husband. I really the engraved candles so would like to try that…or maybe the etched glass. If it didn't work out for me I'd use it as a gift to give someone who would really appreciate it. My boyfriend is a toolaholic, but I know he doesn't have this. He's looking over my shoulder right now and drooling! I would use it to refinish furniture (a new hobby of mine)! I know it might sound strange but I use my old one for grinding down my big toes. Please accept my entry. Thank you. I would like to give this to my husband as a holkiday gift and then he can do some awesome projects around the house. I make bird houses and the Dremel would really come in handy when making these. I would use it to trim my dog's nails. Also grind out some old grout so I could regrout with new color. I would use it to make a wreath! I would give this to my step-father for Christmas, I'm sure he'd use it for MANY things including refinishing their antique dining room set. for the past 35 years or longer.I have had to make very small cuts on wood, antlers,metal,and more. My Hubby says this is Great to use for the Boy Scout Pinewood Derby, and other projects. I would love to the the Terra Cotta patio lights, how cool! I would love this!! would love to get wood working savvy! I would love to have this for some antique restoration projects I'm working on. My husband wouuld love this, he'd use it when making wood projects and cleaning up old tools. I would use it for making cute little birdhouses for my back yard. I am an early bird! I would love this for etching things for sure. That was what caught my eye on the project page- that and the terra cotta pots! I would make an Aggravation board-I remember my mom made one years ago! We need to replace some plumbing,but have been putting it off.This would make quick work of some of the trickier parts. Aside from using the Dremel as a Xmas gift for my hubby, I would love to use it to drill holes in beachglass! I have a number of old tools that need cleanign and restoration–the dremel would make the project a lot easier! I would use it to add a special touch to a birdhouse I would like to build. I would give this to my dh because he would us it for a variety of things.. esp for sharpening his mower blade. I would polish the ports on my engine! Oh I so want to make those Terra Cotta Patio Lights for my backyard and to take on campouts, I have seen them at craft shows and never could figure how they cut the stencils out, now I know! I would give it to my husband for him to rout a keyhole for the new shelf he is making. I would give this to my son for Christmas. He loves working with his dad's Dremel and would love to have one of his own. I would use it to personalize all kinds of crafts for my son! I would use it to refinish furniture and for other home decor projects. This would be a really nice christmas present for my husband. He loves working on his car. He can use it for Repairing an Auto Ding. I would use it in jewelry making, I've always wanted to try that! I would give this to my son-in-law for Christmas–he makes wooden toys for children. I did not even know you could use this for Sharpening a Lawn Mower Blade. How cool is this? I seen where it can be used for many things though on the website. My husband could sure use this. Hubby would love this! He would use it to do the woodworking and he is going to make baseboards so this would be perfect! I know my husband would find 1000 ways to use this Dremel tool. The Dremel is great for sanding in tight areas. I have used my old one on my sanding my patio furniture. I really need a new Dremel! I would use it to replace our rusted out gutter corner! I would use it for some diy home renovation and fixes. What wouldn't I use it for? I'd probably end up using it for different woodworking or home improvement projects I've got going on though. good stuff! Thank you for the fun giveaway. I love the Terra Cotta Patio Lights idea! We would use this for woodworking projects! I hope to start doing more of my own home maintenance, and this would be a great addition to my tool kit! My husband loves his dremmel, uses it for everything, I've even used it to file my acrylics! Would love a new one, ours is so old already. I would use this tool to make unique ornaments for christmas, embellish frames for paintings,garden decorations. The use for this tool is endless. I love the gourd birdhouse and luminary projects. There's no end to what you can do with a Dremel. Thanks! I'd start by making a new street address sign. Then, I'd find about a million other things to do with this gem… as I've been coveting one for YEARS! Thanks for the fabulous prizes! I would give this to my girlfriend so she can use it to make cigar box guitars. I would use this for my craft projects. I'd find many uses for this in my workshop. I'm currently making myself a hutch! I'd use this for building and mataining model locomotives as well as restoring antique gas powered farm engines. I design and build miniature furniture, so I need this. I'd use it for carving designs into the furniture, and lots of other small, intricate tasks. I'd like to use it to cut out electrical box openings in drywall when I insulate the garage. I like making wooden Christmas Ornaments so this Dremel tool would be great for sanding small areas of them and for cutting out circles for the ornaments. My husband could use it in his workshop -he wore out his old one – he used it alot to sharpen the blades on his mower. My husband is the "tool man" and I'm sure he'd find many uses for this in his workshop. I would use it to make my husband holiday that much better. He's always asking for tools and I'm clueless. You've picked out a great one for me! Hubby would use this in his woodworkings. Thanks for the chance. I would love to make the Engraved Candle! i would use it for a present for my husband,he is always saying he needs tools…it would be great to different projects around the house.. I would use this the same as I use my old old Dremel tool for….putting special touches on craft models and figurines. I would use this to file my dogs nails. I was just wanting to buy one. I'm hoping that I'll win one instead! This would be wonderful! I work with glass a lot and metal, so tools like this help me to create art pieces for hobby. Dremel is a great brand too, I love their products. Thanks!! I would use this as a Christmas gift for my sweet husband – we're laid off, and expecting our first child, and he loooves this kind of thing!! My husband just asked for one of these for Christmas. :) We are renovating our 1925 house ourselves, so we need all the help we can get. This device would have been fun to use for pumpkin carving! I would give this to my husband as a Christmas gift. He builds RC airplanes out of balsa wood and had borrowed a Dremel to do most of the work on it. I'm sure he would just love to have his own for that and many other projects! I have about 8 pieces of crappy furniture I have collected with the intention of re-staining them, lots of them have ornate and difficult areas to sand, I would totally use this to aid me in making them beautiful again! I would love to win the new dremel. I would use it for my mixed media art and jewelry. I would use it to sharpen lawn mower blades and my scissors. That would be great for cleaning up the corners of my cupboards ! I would be giving this to my husband for Christmas. He has almost no tools due to a shed fire a year and a half ago. He would appreciate this one very much. I would do more detail work on my scroll saw projects, to make them look more professional and interesting. Used Google to post comment. I would love to win this so I can replace the one I broke.. lol my husband would be a happy man.. I would use it to make my xmas gifts and crafts this year. This is a grea verastile tool. I'd personalize my own frame! My husband wants to try making wooden toys and I'm sure this tool would be useful to him. I am planning on revamping my sons treehouse in the spring and this would come in soooo handy! If I won, I would give this to my brother because he loves working with wood, he sculpts, he makes toys etc. This would be perfect for him! cdziuba@aol.com My friend USED this last week! She did her pumpkins, and now I want one to carve my pumpkins next year! And for other projects. I would use this Dremel for grinding and sanding. I would love to win this for my husband. Recently, he started building furniture for our home. So far he's built two desks, that came out wonderful, however he really doesn't have the proper tools and needs to borrow from my or his Dad. The next project that I'd love for him to build, is a tv entertainment console for our family room. it's a little late now but I'd love to use it next year carving pumpkins! My husband would love this and I'm sure he would have a million uses for it. The one thing on their site that called out to me was using it to re-slot a stripped screw. Almost everytime I try to assemble furniture or shelves, I end up stripping a few of the screws. I've always wanted one of these!! I would use it for odd jobs around the house – triming drywall, sanding small corners – removing grout. Even though Halloween just passed, I would love to carve pumpkins with this tool! I would love to win this for my dad. for making some crown molding. My Husband would love this, I had purchased him something similair 10 years ago but it broke due to over use. Hope the real thing stands up better. We used it mostly for making wholes in things but after visiting the projects site I would use it for so much more, like sharpening blakes and crafts. My husband would use it in his woodworking hobby. It would work good for finishing detail work. I would use it to etch glass and many many more things. What a great tool! I would love to give it to my husband! I would also like to use it for pumkin carving and glass etching! All I want for Christmas is a Dremel! can you tell I am excited about this? this tool can be used to reslot a stripped screw – we need that! We've just bought a new house so any tools come in handy right about now! I would use it to help refinish some of the furniture pieces that I have been wanting to do. It would make for some easy work. This probably sounds wierd, but before my last dremel (an oldie!) died, I used it to file my dogs nails, kept them short and dull!! I would deffinatly give this gift to my fiance! He LOVES woodworking, but has not had the chance since we currently live in a appartment. It would deffinatly be a great addition to his tool collection! We had a Dremmel before (it is now dead) and i actually made a RUDDER for my sailboat. I was stuck somewhere, bored, with a piece of wood—and only a dremmel. After a few hours, we had created a new one—and sailed home. We have always talked about that Dremmel; it did some serious good work that day. So, i'd use this for whatever comes up…but i know my hubby would love a new one for xmas!! I would use it as a gift for my husband!! What guy wouldn't want this!! This would make a great gift for my husband! He would use it to clean up some old tools and antiques and for some projects around the house. With any luck I would get my hands on it too for some craft projects. My husband has a tool for everything! I would use the Dremel 4000 as a Christmas gift for him! Then I will put him to work! Thanks for the great giveaway!